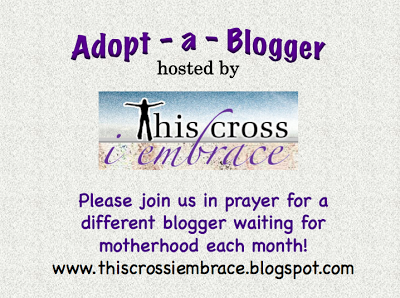 This Cross I Embrace: ADOPT-A-BLOGGER!!! ALL bloggers, readers, commenters, lurkers, lurchers, creepers, crazies, borings, snorings, dazed, confused, and willing - i.e., ALL OF US - will be uniting our prayers for the entire month for the blogger mentioned above. At the same time, across the country, across the Americas, heck, even across the world, our prayers will all be directed in the same place, at the same time. FOR A WHOLE MONTH! Get ready for some SERIOUS fruits, people! Click on the blog link above to visit the Blogger of the Month's post in which they will give you a brief history of their journey with infertility/adoption/childlessness. Then, continue to follow up and check in on that blogger throughout the month, to become more familiar with them and better align your prayers with their intentions. The idea is to pray a Childless Blogger, one of our own, to a Childless-No-More status. To bridge that final gap, to knock down that final wall, to make them MOMMIES against all odds!! Above all else, our prayers will be for peace and joy in their hearts as only God holds the answer to these prayers. All month long! A new Blogger will be announced at the beginning of each new month. This post will be updated on the 1st of every month, so be sure to check back! Pray whatever prayers you'd like. Do a Novena. Say a rosary. Meditate. Say a litany. The Memorare. Whatever your heart desires, whenever it desires it. You may also choose (and this is HIGHLY ENCOURAGED!) to offer up your suffering, any suffering at all, for the Adopted Blogger. Your offering can be as small as your patience with an overtired, sugar-high toddler, or it can be as large as offering your cycle (if you are going through infertility) in the hopes that your cycle will be instead the cycle in which their child is conceived. Singles? You, too have an excellent opportunity to offer your daily wait for a spouse. Not trying to conceive? That's okay- hey, trust me, I'm sure we ALLLLLLL can find some form of suffering in our daily lives to offer up! So, join in, one and all, and please feel free to STEAL this lovely Bloggy Button below created by our own Rebecca @ The Road Home. The button should link back to this post on your page (steal the URL from above), so that all blog readers can learn how to join in, and WHO to pray for! 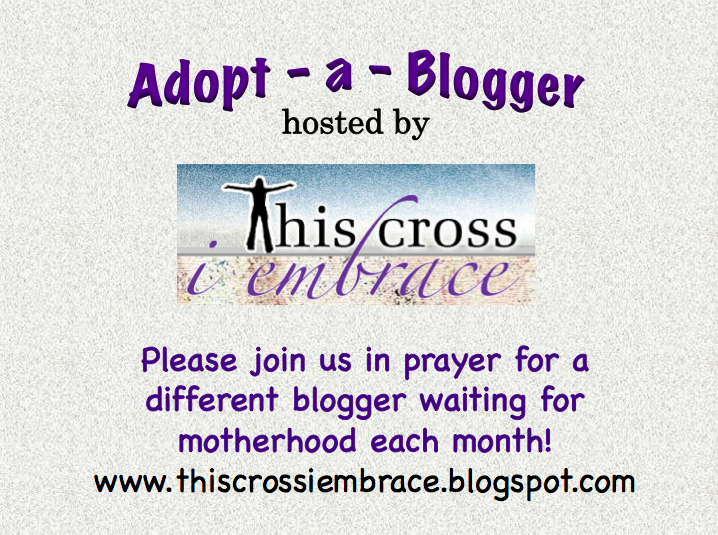 Thank you for participating in the Adopt-A-Blogger Prayer Campaign!!! Your prayers are powerful, and so very much appreciated! I am more than grateful to be the first adopted blogger! God bless all of you and thank you for all of your prayers! Yay! So glad you liked the button - and I'm so glad JB is first! Love this! Already have the button posted loud and proud of my blog! Neat! I will be praying for jellybelly and will add the button when I get a chance - nice work Rebecca! this is a great idea!!! I am on it JB! This is a brilliant idea! Love it! I love this idea in so many ways. Way to coordinate. Can't wait to see how IF falls as our prayers ascend! I'll add the button to my blog. So excited to be praying for you this month! what a great idea!! excited to offer it all up with all of you for one person each month. lord hear our prayers!! Praying! Love this so much. Thanks for doing it. I love this idea! Will definitely be praying for you, JellyBelly!! Praying for Jelly Belly and all the ladies here hoping and praying for babies! I know I'm older than most of you, BUT is there any way I could be prayed for in an upcoming month too? Please? Thank you so much! Hi Amy! I would love to be included in being one of the bloggers being prayed for. I will pray for Rebecca this month. This is such a wonderful idea!! Thank you! What a beautiful idea! How pleasing to God this must be that so many would agree to pray for someone else whom they probably do not even know. Wonderful! I will definitely join in. I have never conceived, and had a hysterectomy at age 27 because of cancer. So, I know deeply the pain of infertility. Many prayers for each adopted blogger. Can I be considered for this, please? All ladies suffering from endometriosis, pcos, and infertility are in my thoughts and prayers! If you need prayer or a friend, please come visit my blog! It's updated! I just wanted to add that if anybody needs prayers (and if you would like to request a free St. Gianna prayer card), please visit me over at my blog, leave a comment, and I will pray for you! If you would like the free St. Gianna prayer card, you can email me with your address and I will be more than happy to send you one! Hope to meet some of you and make some new blogger friends! I could really use some hugs and prayers myself! Thank you so much! Oh boy, I forgot to sign out of my other email address - sorry! Click on my name here and you can visit my blog and say hello (and request prayers and a free St. Gianna prayer card!). Thanks! Lovely. I pray for all to follow God's divine will in her own way. Our Parish Goal is $80,000 to pay on our debt for the renovation project.